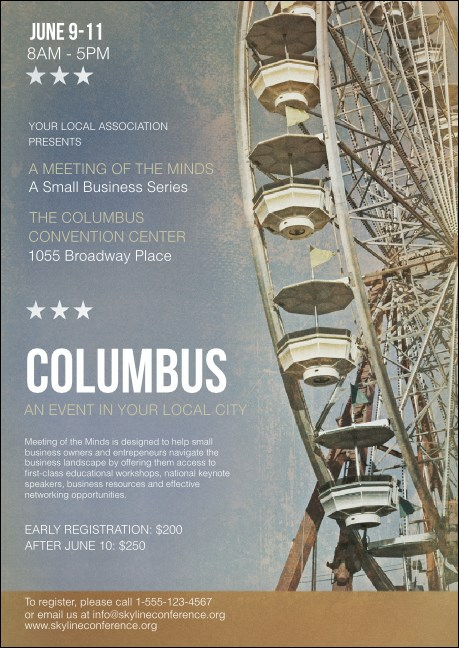 Keep the Midwest close to your heart when you advertise in advance for your next event in ‘the heart of it all’ with Columbus Club Flyers. Send these Club Flyers out to your Cowtown guest list and watch the RSVPs roll in with a beautiful background image of the Ohio State Fair’s Ferris wheel and twenty-two lines of text for all your event details. Grow your event in the Biggest Small Town in America at TicketPrinting.com.